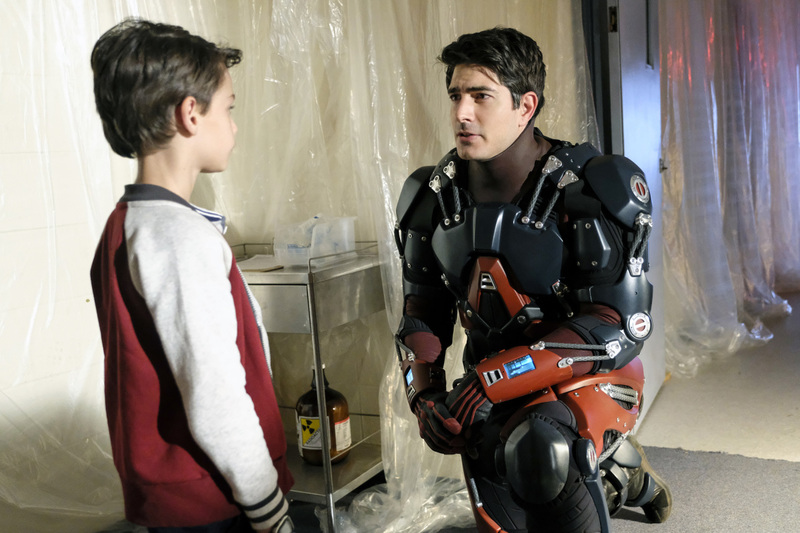 DC's Legends of Tomorrow -- "Phone Home" -- Image Number: LGN304a_0213.jpg -- Pictured (L-R): Jack Fisher as Young Ray and Brandon Routh as Ray Palmer/Atom -- Photo: Bettina Strauss/The CW -- ÃÂ© 2017 The CW Network, LLC. All Rights Reserved. The Legends are heading to Ivy Town 1988 after learning that young Ray Palmer dies as a young boy. This news comes at a bad time as Ray was leading a team building exercise to welcome Zari. One of the exercise is the famous trust one where Mick slips through as Ray disappears. We see that young Ray was shot and killed by Agent Smith who we met during last season’s crossover. The Legends learn that Ray dies on Halloween 1988 so the team head to the day before and we get Ray back. DC’s Legends of Tomorrow — “Phone Home” — Image Number: LGN304b_0034.jpg — Pictured (L-R): Jack Fisher as Young Ray and Dominic Purcell as Mick Rory/Heat Wave — Photo: Bettina Strauss/The CW — ÃÂ© 2017 The CW Network, LLC. All Rights Reserved. The Legends follow young Ray after school and sees him being bullied whom Ray remembers as friends. Mick then sees young Ray steal a whole bunch of candy to the surprise of Ray. The team can’t see how young Ray dies and are about the head back to the Waverider but Ray follows his young self home and spies through his bedroom window, young Ray feeding a baby Dominator, who he names Gumball, some candy and that his how he dies. And can I say how cute the baby Dominator was. DC’s Legends of Tomorrow — “Phone Home” — Image Number: LGN304a_0120.jpg — Pictured (L-R): Brandon Routh as Ray Palmer/Atom and Tala Ashe as Zari — Photo: Bettina Strauss/The CW — ÃÂ© 2017 The CW Network, LLC. All Rights Reserved. So it is about to Zari and Ray to head back into his childhood home to kidnap Gumball and get it back to its home and fix the anachronism. Unfortunately, young Ray has skipped school forcing Ray to shrink down in his ATOM suit and Zari to hide under the bed. Gumball thinks Ray is a toy and starts to play with it, young Ray grabs the ATOM and places him on his shelf. Young Ray has stayed home so he can watch Singing in the Rain. It is a really cute scene as we see Gumball, young Ray and Ray enjoy the movie. More bad luck comes when Ray’s mom comes home and Nate notices how attractive Mrs. Palmer is. Also, Mick likes Fiddler on the Roof. Mrs. Palmer is not happy at young Ray for skipping school and thinks he has taken in another stray animal. Mrs. Palmer is about to find Gumball when Nate and Amaya arrive under the guise of animal control as a distraction. Mrs. Palmer talks to Nate about how young Ray has no friends and is at a lost at what to do with him. Young Ray and Ray hear this. This leads to young Ray taking Gumball and running away. Ray asks Zari to follow his younger self but he is not receptive to her help. Zari eventually finds young Ray in his Camelot hideout and Ray encourages her to play along with his game. This gets young Ray to come out but both he and Zari get captured by Agent Smith. We see Agent Smith subdue Gumball and we also see Gumball’s mom arrive. the Mominator confronts Sara, cocoons her and reads her mind. Ray frees Zari and the two free young Ray. Young Ray returns to get Gumball and releases him from his torture. Unfortunately, Agent Smith and his crew arrive and tries to stop Ray et al. from getting away with Gumball. Their actions piss off Gumball who controls the agents into performing the “Good Morning” number from Singing in the Rain and it was hilarious. Sara also realizes that the Mominator is headed to Ray’s house after reading her mom. Nate arrives to try and save her but instead is getting seduced by Mrs. Palmer. Unfortunately, Mrs. Palmer is the Mominator as Amaya found the real Mrs. Palmer cocooned. Also, Sara notices that Mick, Jax and Martin took the Waverider back to Central City 2017. Why you ask? Well it is for Martin to see the birth of his first grand child. The reason why is because Jax is noticing how distracted Martin has been lately. Mick believes it is because Martin is betraying them to the Time Bureau and the proof is Martin converting Rip’s old storage room into a lab and a white board contains calculations to create some sort of time radio. The two also notice the time ship logs were being erased. When Jax and Mick find Martin boarding the time ship, Mick breaks it. The truth is that Martin made a time tablet that allows him to FaceTime with Lily and used the time ship to give her the other tablet. Martin didn’t say anything as he wanted to show that he is still committed to the team but he gets distracted when Lily tells him that she is in labour. The three men make it in time and Lily gives birth to a boy named Ronnie. Back to 1988, Zari and young Ray steal bikes to get away and she uses her air totem to get the bikes to fly creating an homage to ET. In a forest clearing, the team and young Ray get teary-eyed as Gumball is reunited with its mother. Back at the Palmer residence, Ray erases his mom’s memory and Nate explains to Mrs. Palmer that it was a possum that created all the destruction in her home. Before leaving, Zari gives young Ray a nice pep talk and gets him to go trick or treating. Young Ray is dressed as the ATOM and the Legends are dressed in their costumes including Zari’s new outfit that is an homage to her comic book look. On the Waverider, Ray and Zari decide to see Singing in the Rain. Before they do, Jax asks for Ray’s help in severing the bond between him and Martin so he can return to his family. This paves the way for Victor Garber to leave the show.